Believe it or not, turntables have recently made a comeback. Though, they are not exactly like the ones that your parents had. 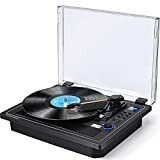 Turntables today kept up with the times by adding Bluetooth connectivity. Nevertheless, finding the best Bluetooth turntable can still be a task for some. In order to find the best one, the most important criteria are that the combination of analog technology with modern technology is done well. Furthermore, they should be capable of offering crisp and rich sounds—similar to what you would typically find in high-end Bluetooth speakers. So, keeping this and several other factors in mind, we will be reviewing three best Bluetooth turntables for you. Let’s dive in! Audio-Technica Corporation is a company that manufactures and designs professional headphones, microphones, phonographic magnetic cartridges, and several other types of audio equipment. It was founded in 1962 in Shinjuku, Tokyo and is presently headquartered in Machida, Tokyo. 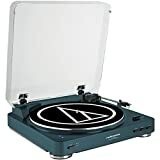 Audio-Technica products are quite popular for their quality and are sold all over the world. Among their proud creations is the AT-LP60NV-BT Turntable. 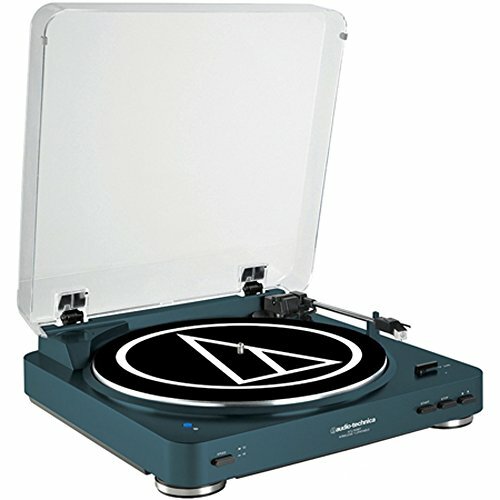 The Audio-Technica AT-LP60NV-BT Turntable is a simple and elegant Bluetooth turntable that is available in four different colors: black, navy, white, or silver. It has rounded edges and a slender base that rests on four feet. This turntable measures 18 by six by 16 inches and weighs roughly about 8.5 pounds. This turntable comes with an aluminum platter and has a fully automatic operation with two speeds. These speeds are 33-1/3 for LPs and 45 RPM for playing seven-inch records with larger center holes. There are controls on the right side of the turntable to start, stop, and drop the needle. When it comes to pairing this turntable to your device, there is the Bluetooth button. While the pairing isn’t the most difficult thing to do, since there is no screen, it isn’t as seamless. You can also use the device via a wired connection. The switch on the back will allow you to either utilize the Line or Phono settings for the internal preamp. There is also a 3.5mm to stereo RCA cable for the 3.5mm audio output. The audio playback on this turntable is quite impressive and delivers smooth and clean audio. If the quality of the vinyl is good, the speaker will improve its audio quality further. That being said, the bass of the speaker lacks that deep thump, which would have made this even better. Wockoder is a company that exclusively designs and manufactures Bluetooth turntables. They come in excellent colors and designs and have amazing features and sound quality. The brand sells its products only on online shopping sites. The Wockoder Bluetooth Turntable is quite an interesting product. It is available in different colors and designs—you can choose one that has a simple and modern design, or one that resembles a classic women’s briefcase. There are interesting colors as well, such as teal, yellow, and more. The turntable comes with several connectivity options such as USB connectivity, SD card slots, and Bluetooth technology. The Bluetooth pairs with most Bluetooth-capable devices. What’s particularly great about this turntable is that it allows you to convert all your vinyl records into digital audio files. This applies not just to vinyl records but also to music from sources via aux cable and Bluetooth. Once converted into digital audio files, you can save them on to a USB or an SD card. The turntable comes with three speeds: 33-1/3, 45, and 78 RPM. This device is equipped with two in-built 5W stereo speakers, which offer decent sound quality. There are also RCA audio outputs, which will provide you with another option to connect your turntable to a more powerful speaker for an even more enjoyable experience. Victrola belongs to the company Innovative Technology, which was founded by Corey Lieblein about 15 years ago. The company boasts over 300 different products, which are sold in more than 10 countries worldwide and 50,000 retail stores. 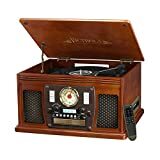 This belt-drive turntable and entertainment center by Victrola is a multi-functional vintage turntable with a CD player, radio, cassette player, and recording capabilities, which seamlessly blends modern and old audio technology. You can convert any audio from vinyl, cassette, or CD into an MP3 format and onto a USB device. There are a 3.5mm aux-in and a cable, which you can use to connect to non-Bluetooth devices. For small speakers, it does pack quite a punch, but if you are expecting deep bass, then it is advisable to connect this turntable to external speakers. The Bluetooth has a range of 33 feet, which is more than enough to enjoy your music without interruption. 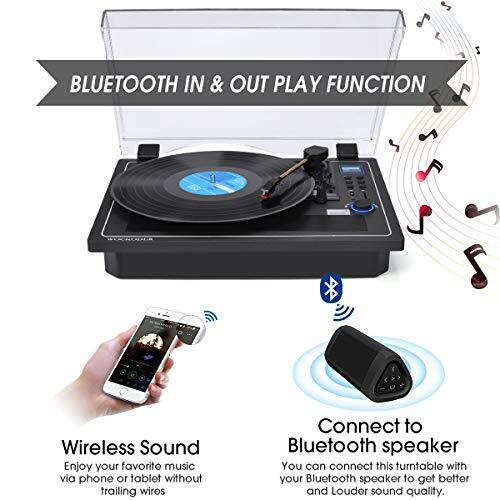 Unfortunately, the Bluetooth is only an input function here, which means you cannot connect your Bluetooth speakers to the turntable. The turntable also comes with FM and AM bands. What we liked about the radio is that it came with a rotary tuner, which gives it an old-fashioned look. There is a remote too, which remotely controls the turntable. What takes the cake is its beautiful retro design and its natural look construction. This will look great alongside almost any home décor. Furthermore, there are several color options that you can choose from as well. And, there you have it! These three are the best Bluetooth turntables on the market right now. We are certain that settling for any one of them will leave keep you quite pleased. Nonetheless, we have to admit that between the three, we really liked the Victrola Nostalgic Aviator 8-in-1 Bluetooth Turntable the most. While its features are quite similar to the other two turntables, this one, in particular, has the most interesting retro design that you would expect from a turntable. For that very reason, this is our favorite.